First chapter today of the whole VCP-DCV 2019 study guide which has 41 chapters to cover. We cover the chapters in no particular order. The study guide page is here – VCP6.7-DCV Study Guide and it is a “work-in-progress”. Today we will be covering Objective 1.1 – Identify the pre-requisites and components for vSphere implementation. Another topic to pass the Professional vSphere 6.7 Exam 2019. In order to become VCP-DCV 2019 certified and pass the Professional vSphere 6.7 exam, we follow are the guidelines from the VMware Exam blueprint 2V0-21.19. The Professional vSphere 6.7 Exam 2019 (2V0-21.19) which leads to VMware Certified Professional – Data Center Virtualization 2019 (VCP-DCV 2019) certification is a 70-item exam, with a passing score of 300 using a scaled scoring method. Candidates are given 115 minutes to complete the exam. Note: Check this post VMware Certification Changes in 2019. No mandatory recertification after 2 years. Older certification holders (up to VCP5) can pass the new exam without a mandatory course, only recommended courses are listed). The two core components of vSphere are ESXi and vCenter Server. ESXi is the virtualization platform on which you can create and run virtual machines and virtual appliances. vCenter Server is a service that acts as a central administrator for ESXi hosts connected in a network. vCenter Server lets you pool and manage the resources of multiple hosts. ESXi 6.7 requires a host machine with at least two CPU cores. ESXi 6.7 supports 64-bit x86 processors released after September 2006. This includes a broad range of multi-core processors. For a complete list of supported processors, see the VMware compatibility guide at http://www.vmware.com/resources/compatibility. ESXi 6.7 requires the NX/XD bit to be enabled for the CPU in the BIOS. ESXi 6.7 requires a minimum of 4 GB of physical RAM. It is recommended to provide at least 8 GB of RAM to run virtual machines in typical production environments. Installing ESXi 6.7 or upgrading to ESXi 6.7 requires a boot device that is a minimum of 1 GB. When booting from a local disk, SAN or iSCSI LUN, a 5.2-GB disk is required to allow for the creation of the VMFS volume and a 4-GB scratch partition on the boot device. If your infrastructure is partly virtualized, you can use VMware converter tool to convert physical systems to virtual machines. The conversion can be a “hot” or “cold”. You can either install the converter software on your management workstation and launch the conversion of powered Off VMs, or you can install VMware converter on the physical system and launch a “hot” conversion to the destination. vCenter Server can still be installed on Windows in this release, but this is the latest one. Make sure to familiarize yourself with VMware vCenter Server Appliance (VCSA) which is now the preferred way to run a vCenter server. With the release of vSphere 6.7 U1, vCenter Server on Windows lives its last version. In the next major release, there will be only VMware VCSA to manage vSphere. 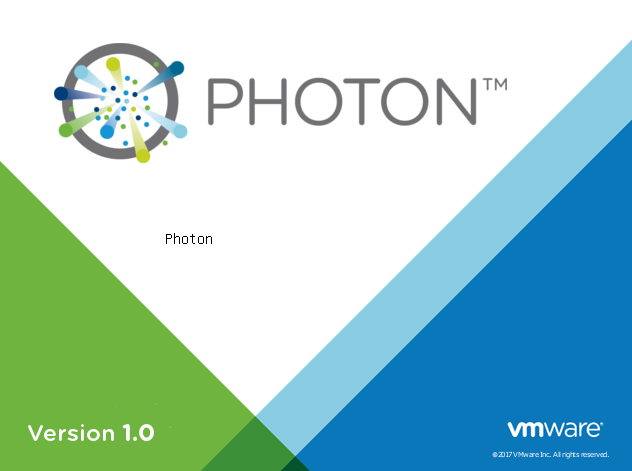 VMware vCSA is Linux distribution based on Photon OS. Some of you who do not follow VMware at all and knows only ESXi then we could say that yes, VCSA is a management VM for ESXi hosts. In order to understand vSphere management, a while back, we have put a simple article which explains What is The Difference between VMware vSphere, ESXi and vCenter. The posts explain the basics of VMware vSphere, which is basically a commercial name for the whole VMware Suite. Again, real basic, real simple explanation to people who do not deal with VMware. The machine should NOT be a domain controller (installation refused). DNS resolution should be working. DB requirements: the PostgreSQL DB bundled is fine for small installations (up to 20 host or 200 VMs). Other than that you’ll need Microsoft SQL or Oracle. 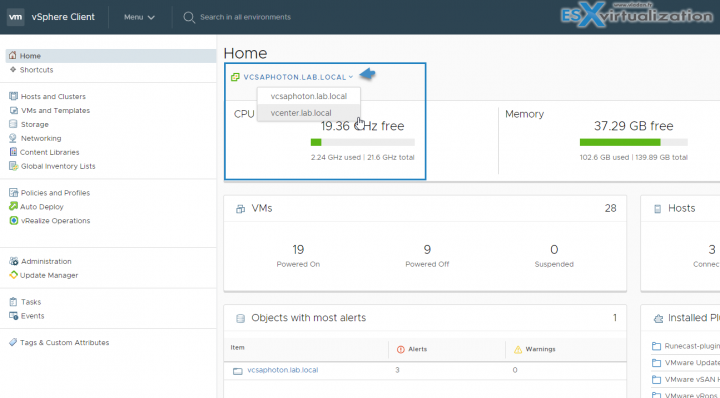 The VCSA appliance runs Linux Photon OS and is manageable via a web-based interface. The management I mean, to set up (change) root password, change time zone, networking settings, configure file backup and get an insight of how this appliance performs in terms of network, CPU, storage etc. The latest version has also the possibility to check how the different VMDK disks aren’t filling up too much (there is a new built-in view in there). In order to connect to this web-based UI, you can use your web browser to connect to a page, where the 5480 is the default management port. You’ll need the root user account and password which has been assigned during the installation of the appliance. Here is the connection URL. You have also a possibility if VMware support asks you to do so, to generate and send a support bundle. You can do that via the Actions menu. 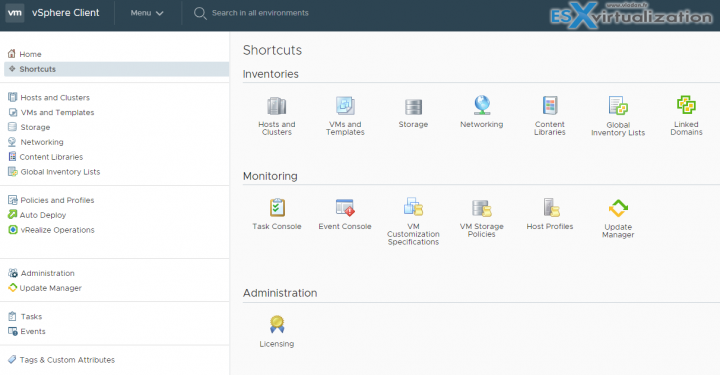 Overview of the web-based access for vCenter Server Appliance for VMware vSphere. As you can see, you can still use the legacy FLEX client where you’ll need to install Adobe Flash plugin as an add-on to your browser. The HTML 5 web client does not need any plugins installed. The vSphere 6.7 Update 1 has feature parity (or even more) now. 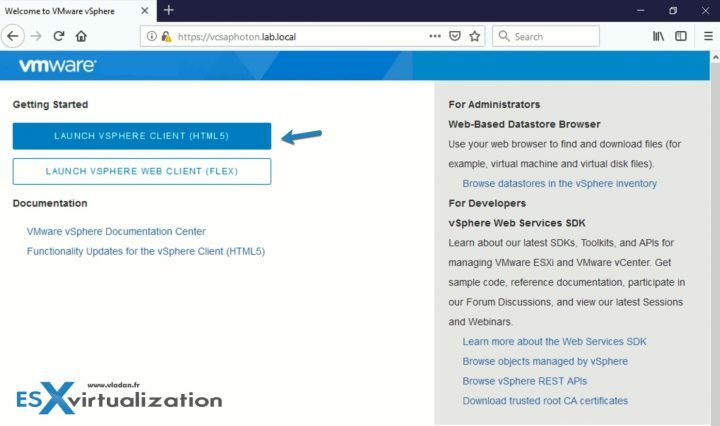 So after connection via the HTML 5 web client, you’ll end up on this page where you have all the icons and all the shortcuts to manage your vSphere infrastructure. Part of the VCSA is also Update Manager which is the VMware preferred method of patching and upgrading the whole infrastructure. During the deployment of the appliance, you select a deployment type of vCenter Server with an embedded Platform Services Controller (PSC), Platform Services Controller, or vCenter Server with an external PSC. When you deploy a PSC appliance, you can create a VMware vCenter Single Sign-On domain or join an existing domain. VMware PSC when deployed separately, in a separate VM, it deploys only the services bundled with the PSC, not the vCenter specific services. There are different topologies which exists and which has advantages or inconveniences but 6.7 and 6.7U1 the preferred way is Embedded vCenter and PSC. While you can still deploy external PSC, the question is, is it worth it? Embedded PSC now fully supports Enhanced Linked Mode (ELM). Previous releases vSphere 6.0 and 6.5 needed external PSC to support ELM. Now, this is no longer the case. 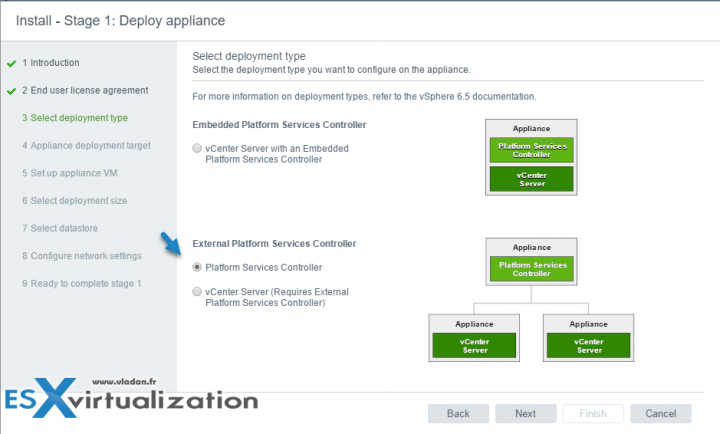 For vSphere 6.5 Update 2 and vSphere 6.7 finally, the embedded deployment is fully supported. I don’t think that you’ll need to know all this bellow, but to give you an idea of the importance of PSC and all the services it runs. 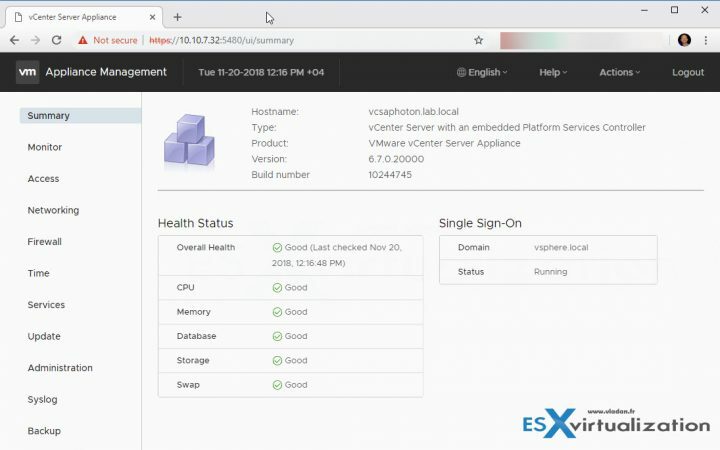 VMware Platform Services Controller Health Monitor – (pschealth) – Monitors the health and status of all core Platform Services Controller infrastructure services. VMware Analytics Service (vmware-analytics) – Consists of components that gather and upload telemetry data from various vSphere components to the VMware Analytics Cloud, and manage the Customer Experience Improvement Program (CEIP). We do not know if we covered everything that’s needed, but have this chapter as a guideline. Your principal study material should be the Documentation Set PDF, as well as your home lab or day-to-day work with the infrastructure.